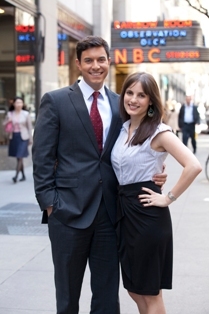 Emmy-Award winning NBC News journalist Tom Llamas '01 and wife, MSNBC producer Jennifer Llamas ’03, will be returning to campus to help Loyola University New Orleans kick-off its centennial celebration this week. Both graduates of the School of Mass Communication, the couple will speak to several journalism classes about the state of broadcast and digital news on Thursday, April 12. Tom will also serve as the master of ceremonies at the Picnic Dinner Anniversary Celebration, held at the Marquette Horseshoe on Saturday, April 14 from 6:30 – 9 p.m. The picnic, featuring food, activities for all ages, music by the Y'at Pack and Loyola's own Johnny Sketch and the Dirty Notes, will culminate with a special appearance by New Orleans’ one and only all-male dance crew, the 610 Stompers, and a fireworks finale. Tom currently anchors the 12 p.m. and 5p.m. news for WNBC, NBC’s flagship station in New York. He has reported on everything from presidential political campaigns to the Miracle on the Hudson, to the earthquake in Haiti. He has covered nine hurricanes, including Katrina, and in 2011 won an Emmy Award for his coverage of Hurricane Irene. Tom is also the recipient of two Edward R Murrow awards. He has also contributed to MSNBC, Telemundo, NBC Nightly News and as a news reader on Today, NBC’s award-winning, long-running morning news program. For more information, contact Matt Lambert in the Loyola’s Office of Public Affairs at mlambert@loyno.edu or 504-861-5448.